I had a great time this week hosting a Talkback with the cast of The 39 Steps at the New World Stages in New York. If you haven't seen the show yet, hurry and catch it. This production closes January 16, 2011. 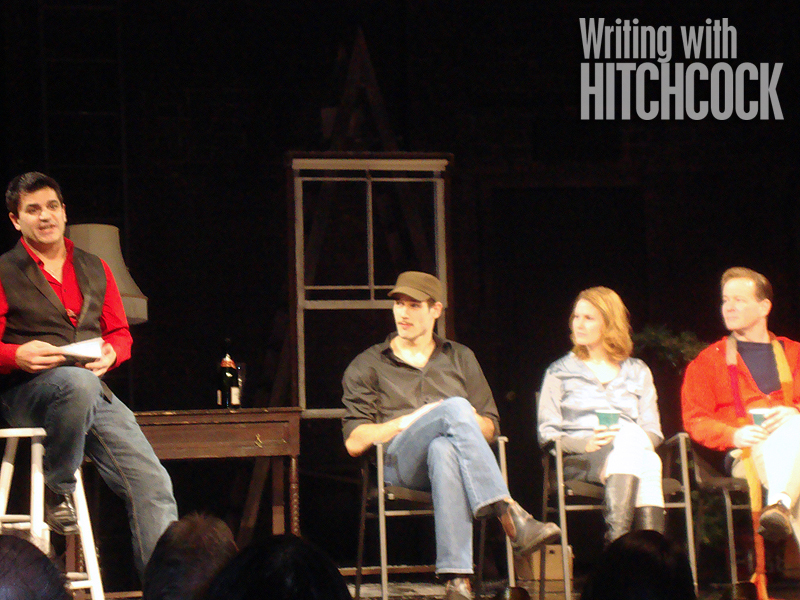 Steven DeRosa moderating Talkback with the New York cast of THE 39 STEPS (John Behlmann, Kate MacCluggage, Cameron Folmar, and unseen to the right, Jamie Jackson). The video quality is more than a bit lackluster (mostly poor audio but there are captions), but gives you an idea of what I spoke about with the cast—John Behlmann (Richard Hannay), Kate MacCluggage (Annabella/Pamela/Margaret), Jamie Jackson (Man #1), and Cameron Folmar (Man #2). We covered everything from Hitchcock's working methods with his writers, to the MacGuffin, to his typical means of adapting source material such as John Buchan's novel The Thirty-nine Steps , how the idea for transforming the film into a broad stage comedy for four actors came about, the actors' process of "finding their clown" within the various roles they play in the show, and much more. "I'd say they do REAR WINDOW next, but the producers of DISTURBIA would probably sue." Robert Burks and Alfred Hitchcock on location for The Trouble with Harry, October 1954. If there is a single blessing to come out of Hitchcock’s association with Warner Bros., it’s the gifted cinematographer, Robert Burks. Yesterday The New Yorker online mentioned Burks's early work in the opening of a documentary short Jammin' the Blues, which airs on TCM Monday, December 6 at 9AM. When Hitchcock started in silent pictures, he was deeply influenced by German expressionism with the work of directors like Murnau, Lang, and Pabst. Their films had a lot of dark, elongated shadows, and odd angles, and this left a great impression on Hitchcock. Now Robert Burks began his career at Warner Bros. in the 1930s, when Hal Wallis was in charge of production. 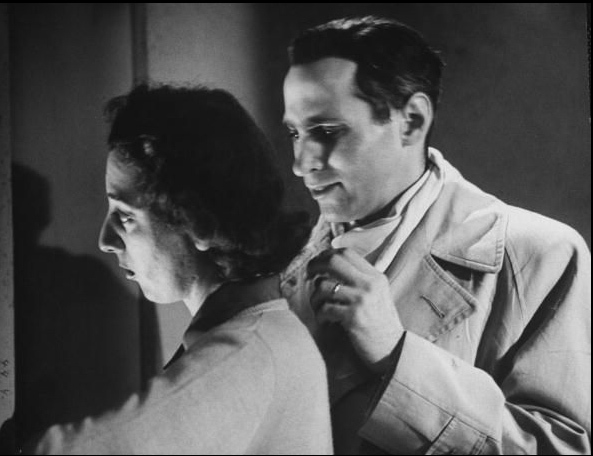 Wallis stressed that his cinematographers give him what he called “sketchy lighting,”—lots of shadows and high contrast. Wallis felt the films coming from other studios were overlit and lacked realism. Burks apprenticed under James Wong Howe, shooting montages and special effects for pictures like King's Row , Marked Woman , and In This Our Life . And this readied him for the long and fruitful association with Hitchcock. Beginning with Strangers on a Train , Burks would go on to shoot all of Hitchcock’s films through Marnie with the exception of Psycho . It's great to see someone calling attention to Burks's early work. Alfred Hitchcock describes how the idea of Albert Hall sequence in the original version of The Man Who Knew Too Much was derived from a Punch magazine cartoon by H.M. Bateman called "The One Note Man." Discussion of Alfred Hitchcock's use of music as a plot device, particularly in the 1956 version of The Man Who Knew Too Much , where each of the musical selections serves as commentary in addition to serving the plot. For more in depth analysis of the lyrics to the Storm Cloud Cantata, the Portents Hymn, and Whatever Will Be, see the forthcoming new edition of WRITING WITH HITCHCOCK. Enjoy and Happy Thanksgiving to you and yours! Much has been said about Alfred Hitchcock’s selection of Francis Poulenc’s “Perpetual Movement No. 1,” which is played on the piano by Phillip in Rope . 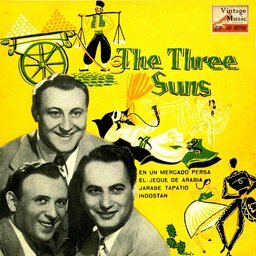 Looking at the other music in Rope which plays over the radio, there is a performance by The Three Suns of “I’m Looking Over a Four Leaf Clover,” the 1927 song written by Mort Dixon with music by Harry M. Woods. Assuming it was not just by happenstance, the character descriptions in the screenplay may actually reveal why Hitchcock selected the tune. Excluding Rupert (and David, of course), let’s consider the other party guests—Mrs. Atwater, Mr. Kentley, Janet, and Kenneth—and how their character traits fit the symbolic representation of the leaves of a four leaf clover…Faith, Hope, Love, and Luck. Faith—Mrs. Atwater, we are told by her description, puts her faith in many things, and this year it happens to be astrology. She reads palms and works out horoscopes, and although she has no idea what she is talking about, her predictions may turn out to be spot on. Hope—Mr. Kentley has great pride in his son and is said to have a “general trust in people” to the point that it has marred his perceptivity. Nonetheless, his hope for the essential good in humanity lends more credibility to his moral compass than to any of the morally questionable theories put forth by Brandon or Rupert. Love—Janet is described as coming from a family that once had money, and so now she “belongs neither to the class she is actually in nor the class she wants to be in.” Although Brandon more than once insinuates that Janet has traded up to David for his money, we do get the impression this is not the case, she’s in love. Thanks to Joel Gunz for pointing out the detail I overlooked when I first published this post. The "I" in the song would have to be Rupert, who looks over Brandon and Phillip, catching the details that he's overlooked before. Hitchcock left Warners after completing Dial M for Murder , yet it wasn’t long before the studio reminded Hitchcock of his informal promise of an additional, or fifth picture. The studio managed to do this just a few months before the original contract would expire. 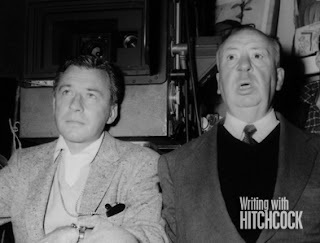 Knowing that Hitchcock was about to embark on a large scale production for Paramount, Warner Bros. requested an extension of the original agreement so that they could still get their “free” Hitchcock picture, and so on April 13, 1955, Hitchcock entered into an agreement to produce and direct The Wrong Man for Warner Bros. Briefly, the story was based on the actual events surrounding the wrongful arrest of Christopher Emmanuel (Manny) Balestrero, a musician in New York’s Stork Club. Subsequent to his arrest for armed robbery and during the course of preparing his defense for trial, Manny’s wife, Rose, suffers a mental breakdown and is placed in a sanitarium. Later, Manny is cleared when his “double” is apprehended, but the damage to Rose’s psyche has already been done. This was a departure from the recent upbeat enertainments that Hitchcock had turned out in his collaboration with screenwriter John Michael Hayes. Hayes told Hitchcock as much, which added to the growing friction between writer and director. Another reason Hayes expressed reluctance to write the project was that the story had recently been done on television as "The Idendified Man" for Robert Montgomery Presents. Robert Ellenstein, who would later play Licht in North by Northwest, played the role of Manny in the TV production "The Identified Man" aka "A Case of Identity" in 1954. The real Manny Balestrero reenacts the walk to his front door for Life. 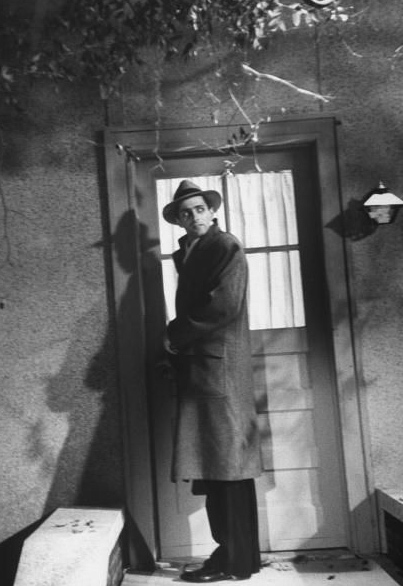 Hitchcock's depiction of Manny's walk to his front door with Henry Fonda as Balestrero. Of course, Hitchcock did not merely want to redo what had already been done on television, and despite his promoting the film as a factual case, his intention was not to make a docu-drama. Hitchcock's focus would be on the mental breakdown of Rose Balestrero. With the exception of North by Northwest (which was actually initiated with Hayes), Hitchcock's post-Hayes films—The Wrong Man , Vertigo , Psycho , The Birds , and Marnie —would each focus on the psychological trauma a character endures. In the case of The Wrong Man , although Manny is ultimately cleared of the crimes for whch he is accused, the real nightmare of Rose's remained. Manny (Robert Ellenstein) tells Rose (Florence Anglin) that he has been cleared of the robberies. In Hitchcock's depiction of the same sequence, the focus is on Rose (Vera Miles). It has long been contended that Warner Bros. insisted on tacking on the final shot of the Balestrero family along with a "happy" epilogue over Hitchcock's "loud objections." Fortunately, the interesting circumstances under which the script of The Wrong Man was written resulted in a trail of correspondence between the director and his writers, playwright Maxwell Anderson and Hitchcock’s longtime friend and occasional collaborator Angus MacPhail, which reveals that the director had both the final shot, and the reassuring epilogue in mind even before the screenplay was completed. MacPhail and Hitchcock worked in New York, researching factual details, interviewing persons like Judge Groat, (Rose's doctor) Dr. Banay, (Manny's attorney) O'Connor and (Prosecuting Attorney) Mr. Crisoda, and laying out the story and the visuals more or less in treatment form. As they completed each section of the story, they sent pages to Maxwell Anderson, at his home in Connecticut. Anderson then set about adding the dialogue, which MacPhail would edit and incorporate into the final script as approved by the director. Correspondence between Hitchcock, MacPhail and Anderson reveals that Hitchcock fully intended both the final shot of the Balestrero family in Florida, as well as the epilogue. As early as March 20, 1956, while the script was in preparation, Hitchcock indicated in a letter to Anderson, "if you would have a 'go' at the words that are to be printed on the screen at the end, I would be very grateful. Not only does this give us a note of relief, but more than that, they [the audience] have been seeing a factual case and I think this is very important." Although Hitchcock had asked Anderson, it was MacPhail who had the first "go" at the epilogue, which he turned in on April 4, 1956. MacPhail’s epilogue went as follows: "Two years after these events Rose Balestrero walked out of the sanitarium completely cured. Today she lives happily in Florida with the two boys. Now they can hardly believe that this nightmare experience was reality. 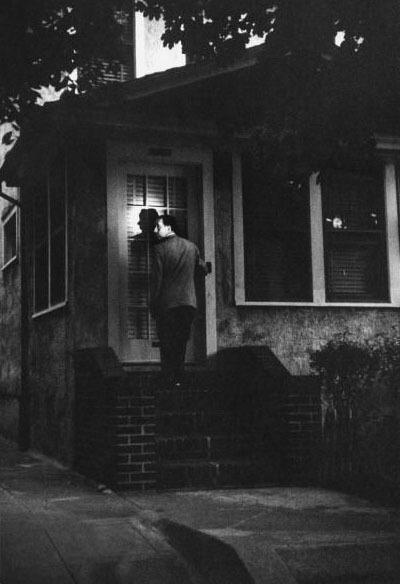 But it did happen to Manny Balestrero, and but for the grace of God, it might happen to you." MacPhail sent his "temporary" epilogue to Anderson, who replied in a letter dated April 5, "I think it's essentially good, but I don't personally think the deity intrudes in these matters, so I just left him out." Anderson simply cut MacPhail's "and but for the grace of God". 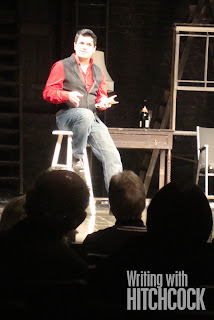 In a letter to Anderson dated April 10, MacPhail indicated, "[Hitchcock] would like the Epilogue to end up on a note of warm reassurance and not on a chilling reminder," adding, "I accept your reproof about the deity." Anderson replied on April 11, "As for the Epilogue, it seems to me Hitch's objection should simply be remedied by excising the two final sentences. We don't need them ... The warm reassurance is there in the Florida sky and in the family group." And regarding the reference to God, Anderson wrote, "I didn't mean to reprove anybody about the deity, but my father was a Baptist minister and I'm allergic." As far as Hitchcock was concerned though, the reference to the Almighty might well have been left in, for as he expressed to a reporter from the Los Angeles Examiner, "The [film's] suspense is due to the thought that will strike everyone, 'There, but for the grace of God, go I.'"